My neglect of “This Girl has Knits” has been playing on my mind for a long time. While it may have been very quiet for me here in blog-land, it has been anything BUT quiet behind the scenes. If you’ve read my blog before, I’m sure you know that I love to create. Create anything, really. I knit, crochet, sew, paint, draw… I love pencils and crayons. And yarn. OH MY, the yarn! For so long, these endeavours have only been a hobby, something I do with my spare time (ahem… the time I should be cleaning the house..). Until a few months ago. While sitting at my desk at work, daydreaming of sewing, I made a decision. I wanted to learn how to make clothing patterns. All the in’s and out’s of fashion, how to make a jacket, how to fit a pair of pants, the best curve for a set in sleeve… All of it! Luckly, I know a very talented lady who has been drawing patterns her entire life, for some of the best known lables (Cue, Seafolly, Bec & Bridge… the list goes on), and she was more than willing to teach me all the tricks of the trade! I arranged with work to take one day off a week, to go and study Pattern Making and Fashion Design. The last 4 months have been so amazing, I have learnt so much, and I have loved every minute of it. But wait, you say, when did this go from being a hobby, to something more? 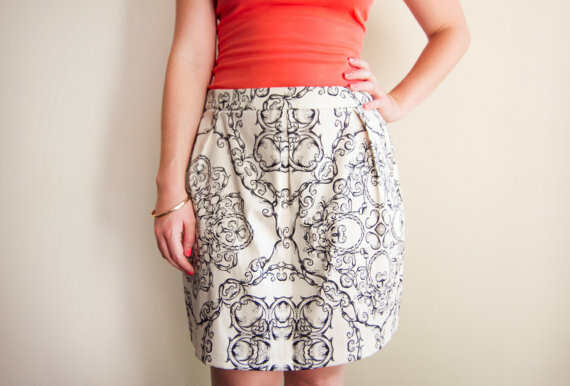 The “Alice” skirt, hand-made by me, and available on the Made by Mitty Etsy Store! I have a new website, a Pinterest, Instagram, Facebook.. All of the social media’s! I’ll also be starting a new blog, which is why this post is titled “the final post…”, on this blog, at least! 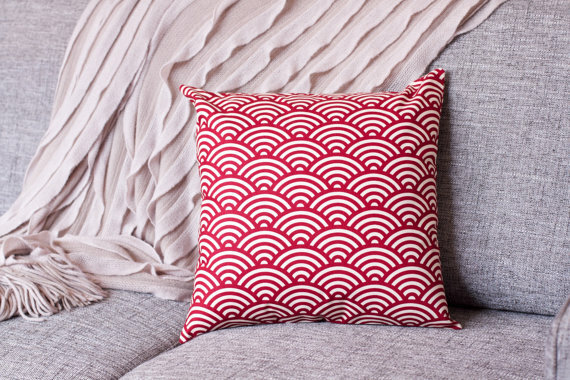 “Seigaiha in Maroon” cushion cover, available on the Etsy Store! I’ll miss posting under the name This Girl has Knits, but if you’d still like to hear what I’m up to (including the upcoming making of a very special white dress! ), please feel free to follow me under Made by Mitty! 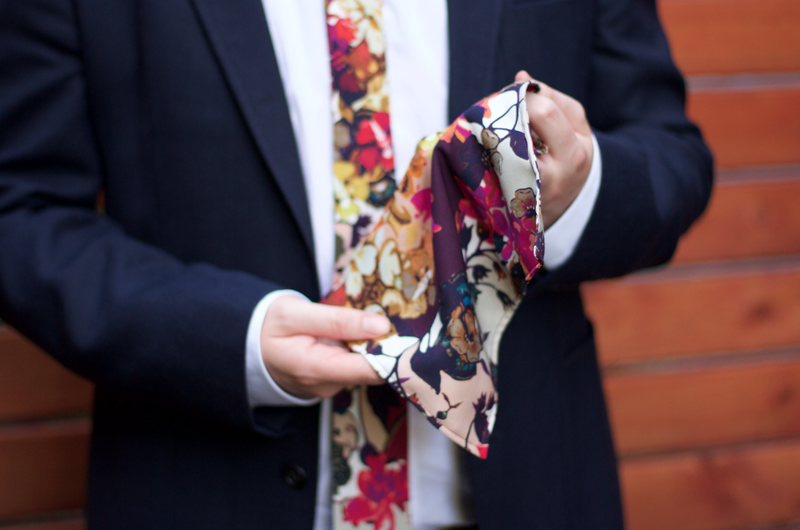 Fiori Colorado Double Georgette Silk tie, available on the Etsy Store! 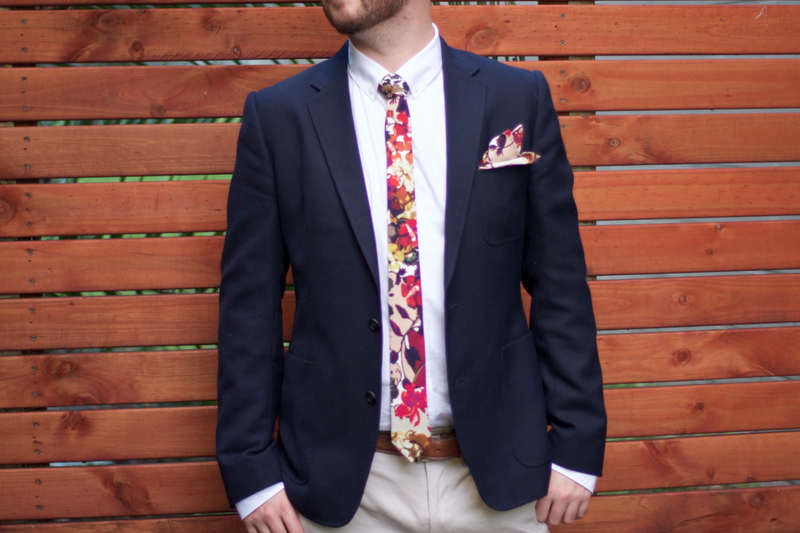 I’m also making mens accessories (ties, pocket squares and bow ties), so the man in your life doesn’t feel left out! I hope to see you soon at Made by Mitty! This entry was posted in craft and tagged Australia, blog, bow ties, cushion cover, fashion, hand made, homewares, skirts, Sydney, ties on April 27, 2015 by this girl has knits. Hello! I hope I still have a few reader out there.. I feel terrible for neglecting this blog for so long, but rest assured, while I haven’t been blogging as much, I have been as creative as ever! I’m still knitting, although not as much. The weather has been steadily getting warmer, and I don’t feel as much pull to pick up the needles. What I have been doing a lot more of, is sewing! I’ve loved sewing all my life. With the help of my talent mum, I made each one of my formal gowns for special occasions. These days, I’m more interested in making things that I can wear every day, and I hope to show you a few items in up coming posts. Today, I wanted to share something a little different. While shopping last week, Reagan and I stumbled on a cute little fabric shop. Inside we found some of the most gorgeous fabric I think I’ve ever seen. After browsing for a while, Reags came up to me with a beautifully patterned Italian silk, and asked me if I could make him a tie out of it. Although I’ve never made a tie before, I was sure I could nut it out. 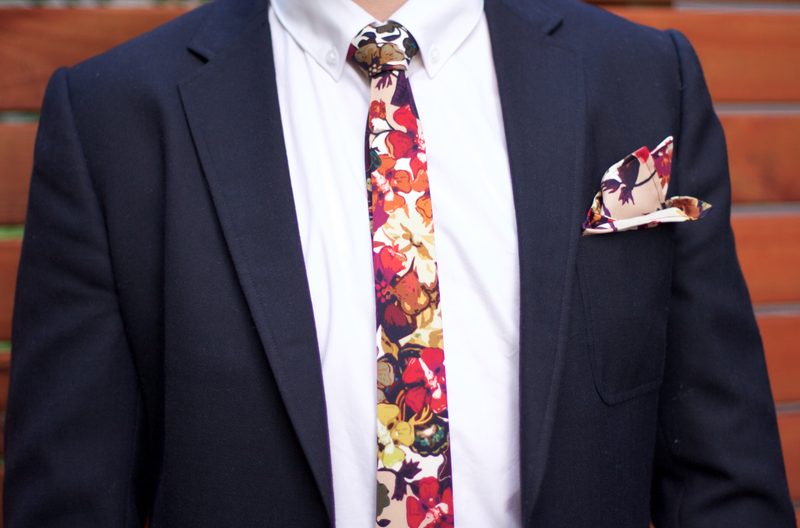 I pulled apart one of his old ties for a pattern, and got to it. 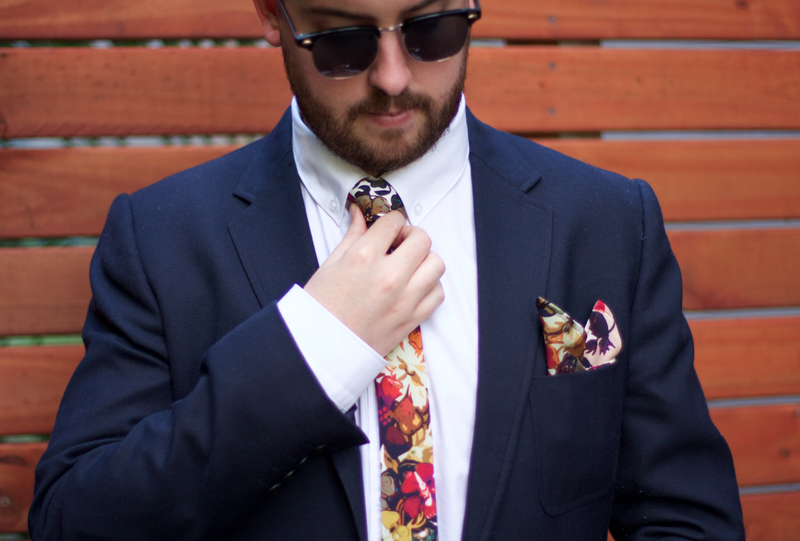 There was enough left over to make a matching pocket square. I love the colourful pattern, and I think it’s a perfect statement piece. Reags is very happy with it, and I’ve been assured he’ll get a lot of wear out of both items. This entry was posted in sewing and tagged handmade, pocket square, Sewing, Silk, tie on November 8, 2014 by this girl has knits. It has been so long since I’ve sat down and painted, I honestly can’t remember the last time I did. I’ve always liked watercolours, and while on Pinterest lately, I’ve been drawn in by the beautiful, flowing, and organic works I’ve found. I decided to give it a go for myself. 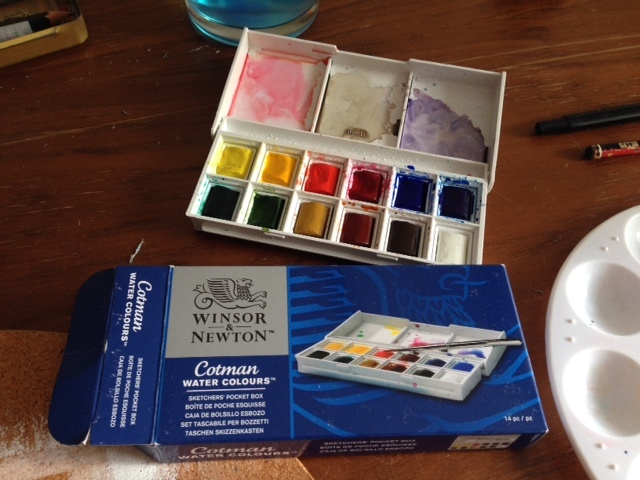 I bought this sketchers’ pocket set of watercolours by Winson & Newton. The little set is nice and compact, and comes with 12 colours and a little paint brush. I was so excited to try it out, I just couldn’t wait! 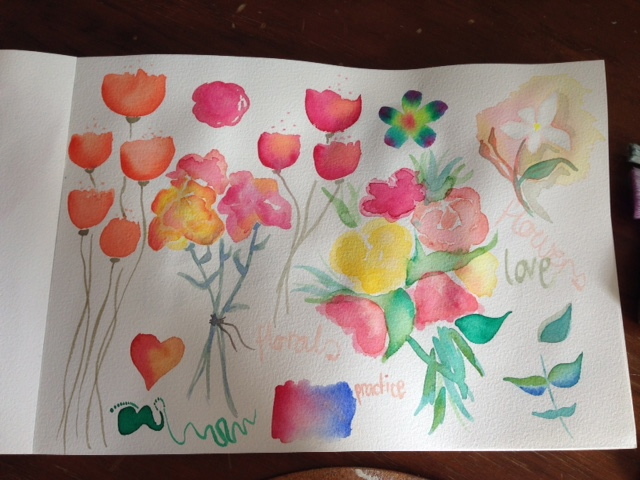 I created a few colour charts first off, to really get to know my new paints. Even thought this set is classed as Student Grade, I was really impressed by how much pigment there was in the washes. Then I watched a few YouTube tutorials. There are so many to choose from, but I particularly like this one by The Frugal Crafter, and these ones by Elizabeth Pontivik. My work is so stiff, compared to what I generally like, but I’m sure with a bit of practice, I’ll loosen up a bit. 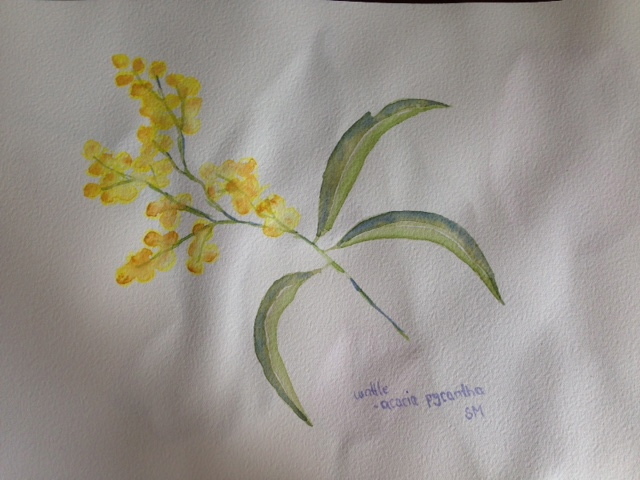 Today I’ve planned to go on a picnic with Reags, I want to take my watercolours along and paint “in the field”. Maybe that will help me find the free flowing style that I like so much! 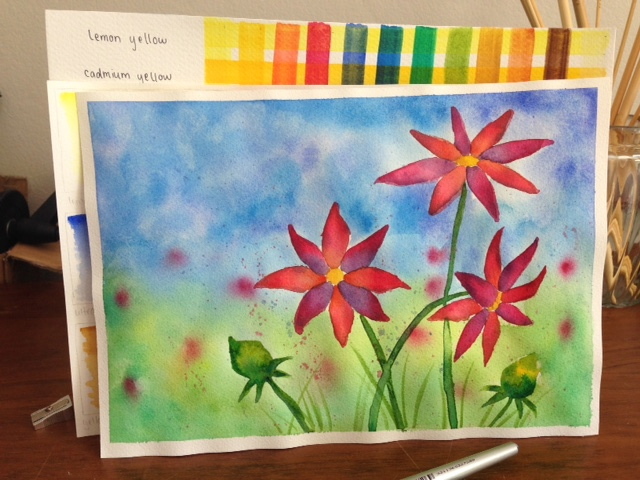 This entry was posted in craft and tagged painting, watercolour, watercolour painting on September 20, 2014 by this girl has knits. Whenever I am teaching someone about knitting, one of the main things I like to get across is this. If you’re not prepared to pull your work apart, you’re not ready to knit. This is something my Mum always used to say when she was teaching me to knit. Realizing that you’ve made a mistake in your knitting can be a really disheartening moment. You’ve worked so hard, and concentrated for so long, and you still manage to screw it up. Pulling it apart and starting again can sometimes be a hard thing to swallow. I cast on the gorgeous Kit Cami last week, and got all the way through the 2.5 inches of half linen stitch, before I realized that I had cast on for the wrong size. How on earth did I do that..?! I blame watching The Vampire Diaries while casting on, obviously I’m easily distracted. Frogging this at lunch time today…! This entry was posted in knitting and tagged circular needle, craft, Knitting on September 15, 2014 by this girl has knits. Chalk paint has been all over Pinterest for a while now, and everyone raves about how easy it is to use, and the gorgeous results it gives. I’ve wanted to do-over my bed side tables for a while now, and I thought this was the perfect project for a first-time-chalk-painter! This is was I started with. 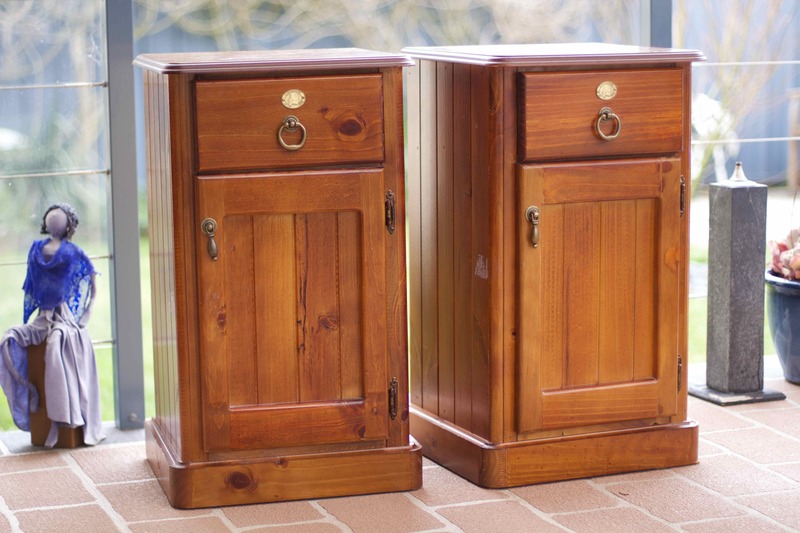 Two, very generic, bed side tables. First, all of the hard-wear was removed, including the doors, handles, and those little disks. Even though I’ve read over and over that you don’t have to sand your item before you paint it, I did give mine a light sand, and a good scrubbing with a brush and some warm sugar-soapy water. The next step, I have to credit to my wonderful dad! Behind the door was just one big open cavity, which I found completely useless for storing stuff. I thought adding a shelf would give me more storage options. I bought a sheet of MDF, and gave dad puppy-dog eyes until he agreed to build me some shelves (thanks dad!). He used the above tools.. I’m taking a stab in the dark here, and am going to call them “air-compressing nail gun” and “drop saw”. Here are the two shelves which dad put grooves in to match the sides of my tables.. and the shelf positioned in it’s new home. Now, onto the fun part! Although I searched, I couldn’t find a retailer that could sell me chalk paint, let alone the colour I wanted. 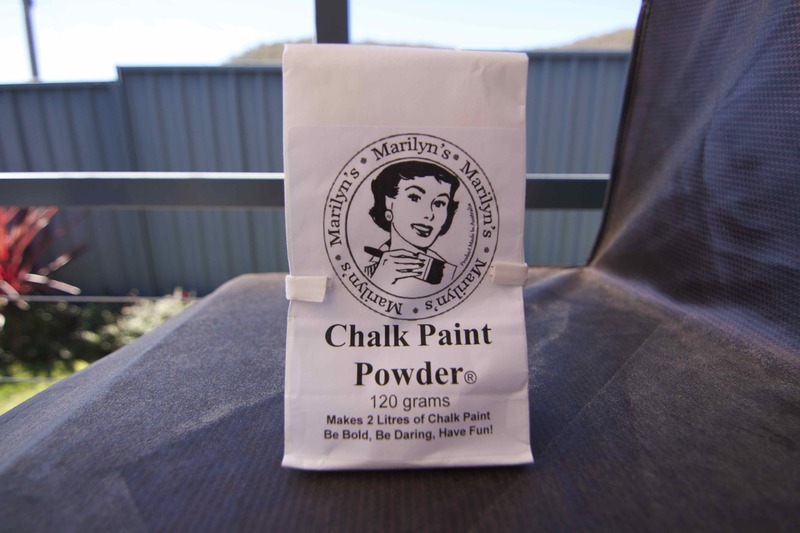 Then I stumbled across Marilyn’s Chalk Paint, which is an Australian company that sells chalk paint powder! This stuff is amazing! Basically, you add it to any low sheen or matte acrylic paint, give it a good shake, and BAM! It will turn it into thick chalk paint! It comes with instructions and measurements, so you’ll never get it wrong! I added the chalk paint mix to my low sheen acrylic paint (in Aqua Chiffon [T10 50B-1] from Taubmans) I started with the shelves, the drawers, and then moved onto the tables. Reags helped me to do a second coat, once the first was completely dry. I felt like the inside of the draws needed a bit of love. My mum has this book full of gorgeous Paisley wrapping paper, which I knew would be perfect! Using regular-old wood glue, I stuck strips of paper over the joins inside the draw, then measured rectangles of paper to cover the sides and bottom. I let everything sit overnight, to make sure it was 100% dry. Then I took to all the edges with some fine sand paper, to give a nice distressed look. 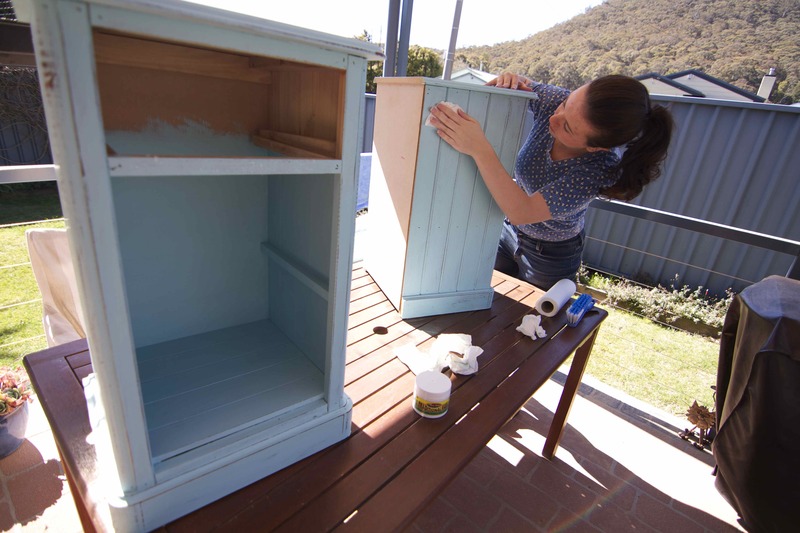 This is where the chalk paint starts to shine! There is a small amount of texture to the dried paint, so the sand paper took off small bits at a time. It was really easy to control how much distressing there was. After a quick dusting, we sealed the tables with clear wax, which you can also get from Marilyn’s. 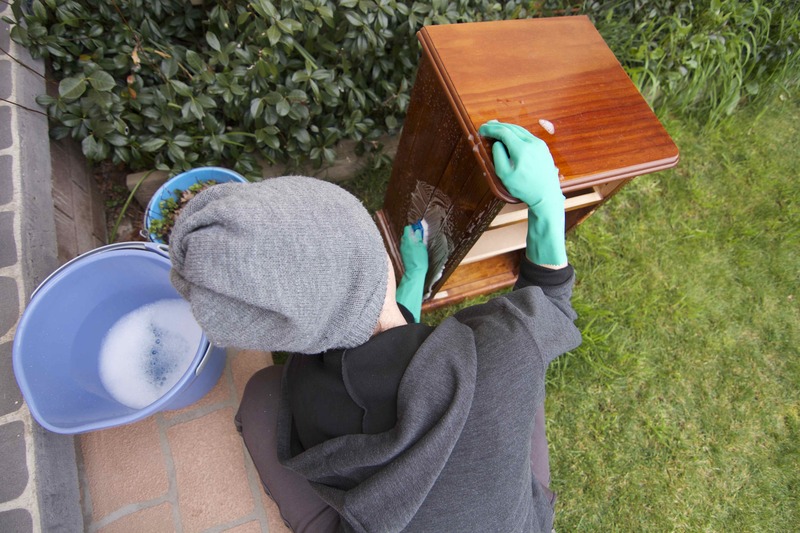 You just apply a thin, even layer of wax to any surface you want to seal. Let it “set” for at least 10 minutes, then get to buffing! I found small, circular motions worked best. The wax is buffed when the surface is silky smooth and shiny. Then it was just a matter of adding the new hard-wear, and inserting the draws. Just like everyone before me has said, chalk paint is super easy, there is little (to no) sanding required, and the results are wonderful! 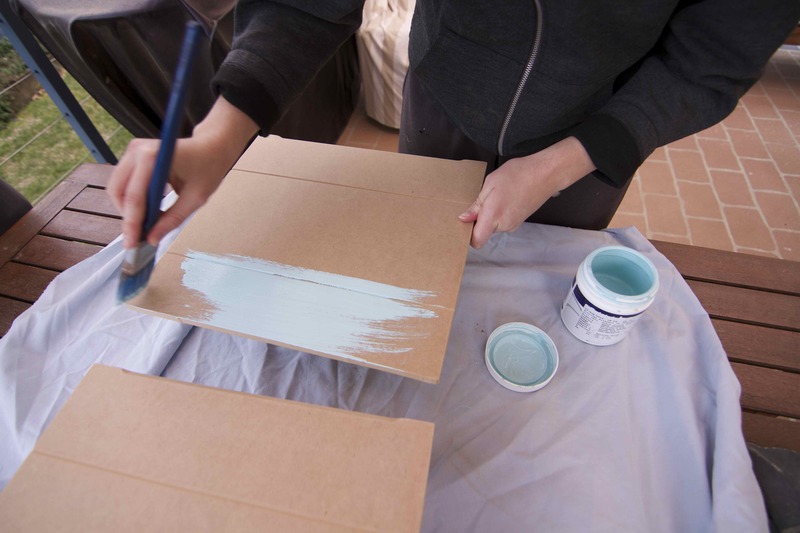 Sealing the paint with the clear wax gives a finish that looks and feels very professional. And how cute are those crystal handles? 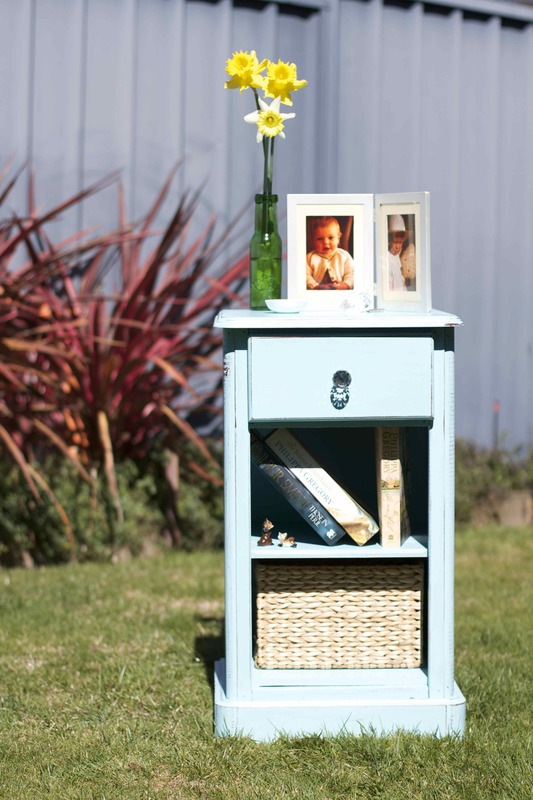 If you’ve every wanted to try chalk paint, I really encourage you to give it a go, you’ll love it! 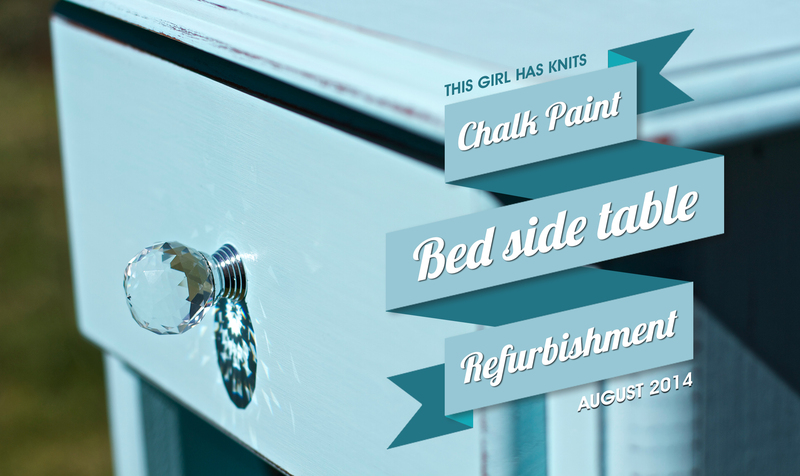 This entry was posted in around the house and tagged chalk, chalk paint, furniture, Paint, refurbish on September 4, 2014 by this girl has knits. It’s been a while since I posted about a finished object! There are a few reasons.. I will finish that jumper.. I will, I promise.. Just, not any time soon.. ANYWAY! Onto something I have finished! 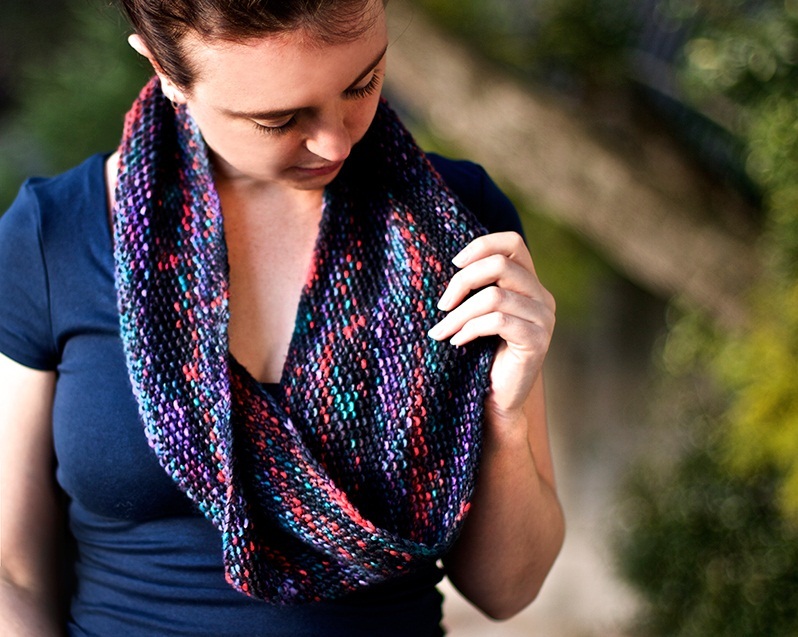 Yes, it’s another cowl! I know, I know, I need to do something different, but I just love this pattern, and I can’t talk enough about the wool! This is Manos del Uruguay Maxima, in the Mixed Berries colour-way. It’s squish and beautiful, I just can’t get enough! Using 6mm circular needles, I cast on 146 stitches, gave the cast on a single twist, then used 1 stitch joined the round. I worked in seed stitch until I ran out of wool. 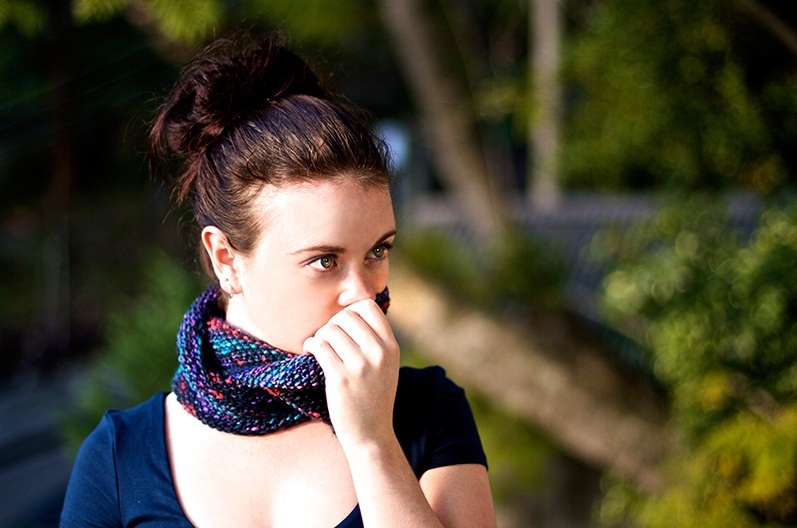 Just like my last cowl, this one is long enough to twist and slip over my head, making a super thick neck warmer. This wool is really gorgeous, you can’t see any distinct twist, it’s almost like the strand has been felted. Love love love!! And, I probably don’t need to share this, but I have another 4 skeins at home, waiting to be made into something gorgeous! I did say that I had 2 FO’s for this post.. And here it is! Haha, it’s not very exciting, just a hottie cover-up! I chose this to teach myself how to knit in the Continental style. I’ve always been an English knitter, but I was curious about Continental. What I found, is that the knit stitch is easy and really quick! 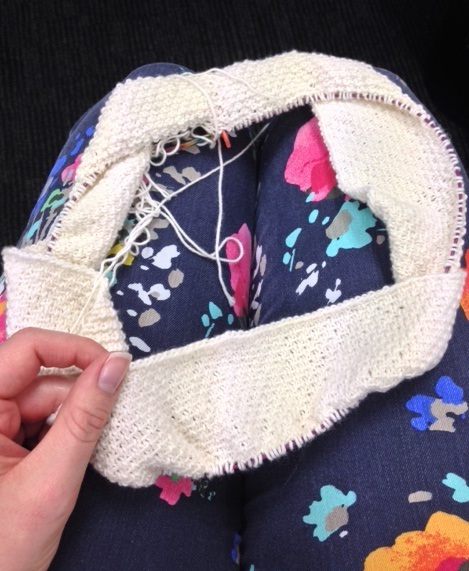 The purl stitch, however, is a bit trickier, and weirdly, it hurt my right thumb when working on the back side. Anyway, I feel confident enough to switch between the two styles, depending on the project, and my mood. Which style of knitting do you prefer? Have you tried both? I’m very interested to know how many people are in each camp! 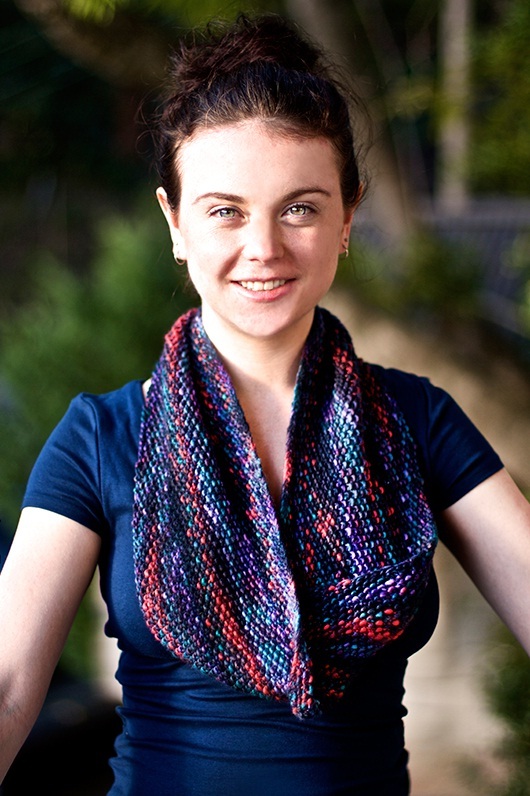 This entry was posted in knitting and tagged circular knitting, cowl, craft, DIY, Knitting, Manos del Uruguay, mobius, Wool on August 25, 2014 by this girl has knits. Dying wool to your own specific colourway is so much fun, and it’s really easy! I love using food colouring to dye wool, and over the weekend, my friend Nyome and I had a blast doing just that! I’ve written posts on dying wool before, but I’ll outline the basics for you. To get the best results, start with 100% wool. My #1 go-to wool is Bendigo Woollen Mills Luxury, in Frost. The balls are a missive 200g, and the wool is gorgeous and soft. Wind the ball into a skein (we used the edge of Nyome’s dining table! ), and tie it off in at least 4 places. This will reduce the risk of the skein getting tangled (which is an utter nightmare!). Then, soak the wool in warm water, with a bit of white vinegar for half an hour. I added about 1 to 1.5 cups of vinegar to the water, but we were soaking 800g of wool in a massive sink! While the wool soaks, you can get started on your dyes. I like to use good quality gel food dye, which you can get some cooking supply stores. Put a small amount into a container (a little goes a long way! ), add warm water, and stir to dissolve. The more water you add, the paler the colour will be. Grab your skein, and squeeze as much of the water out as you can. You want it damp, not dripping. Lay it out flat onto of some cling wrap. Now for the fun part! Paint your wool! There really isn’t any hard and fast technique to this, just apply the dye with a paint brush, and (using a gloved hand!) squish the dye into the layers of wool. 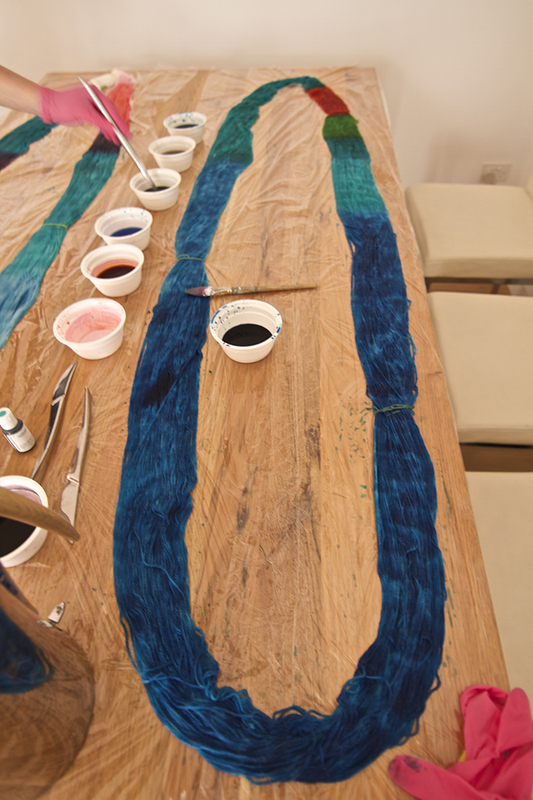 Once one side is completely painted, you will have to carefully flip the skein and paint the underside. When you’re happy with the skein, carefully wrap it up using the cling wrap that it was sitting on. You want to make a neat, tight little parcel. Pop the parcel into a slow cooker to set the dye. Mine has a little wire tray in it, so the cling wrap doesn’t sit directly on the pan. I also make sure to put about 1.5cm of water in the cooker, to make some lovely hot steam. Cook your wool for 1 hour on a high heat. After an hour, carefully remove the parcel from the slow cooker, and let it cool down before you unwrap it. That parcel is going to be full of hot steam, which can give a really nasty burn, so please just be patient! 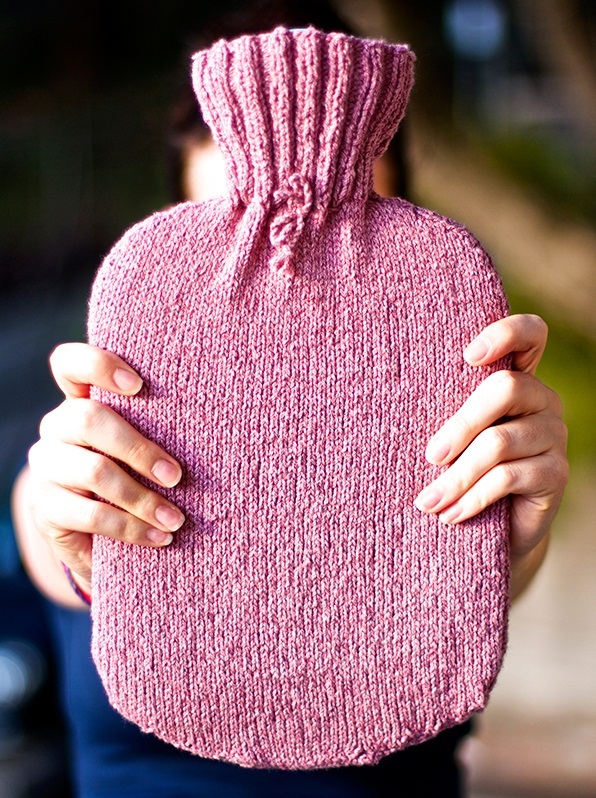 When it’s cool, unwrap it and give it a gentle wash in warm water with a bit of wool wash (or shampoo). There should be little to no dye coming out of that wool, which is exactly what you want. Rinse, squeeze out the excess water, and let it dry. 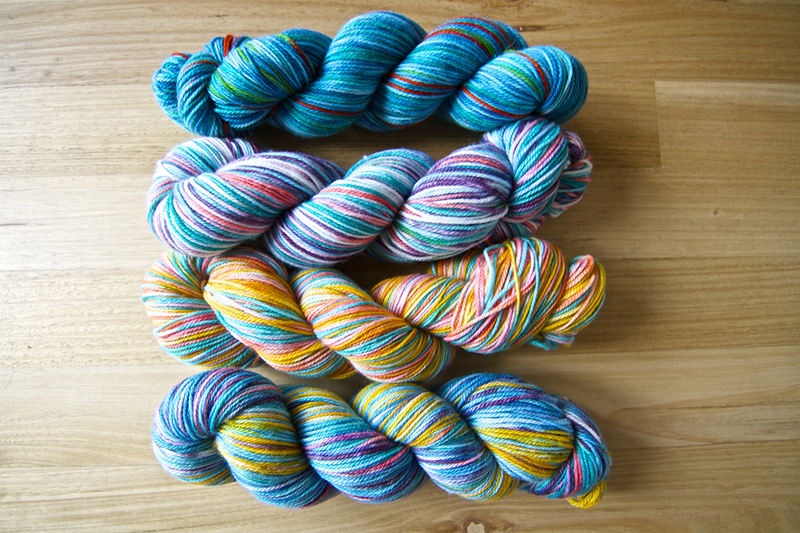 Once it’s dry, you can rewind into different sized skeins, to really show off your colour choices! This really is a lot of fun, and it’s so simple! Now I have to decide what to make with my fantastic wool! This entry was posted in hand dyed and tagged DIY, dying, dying wool, food colouring, tutorial, Wool on August 18, 2014 by this girl has knits. 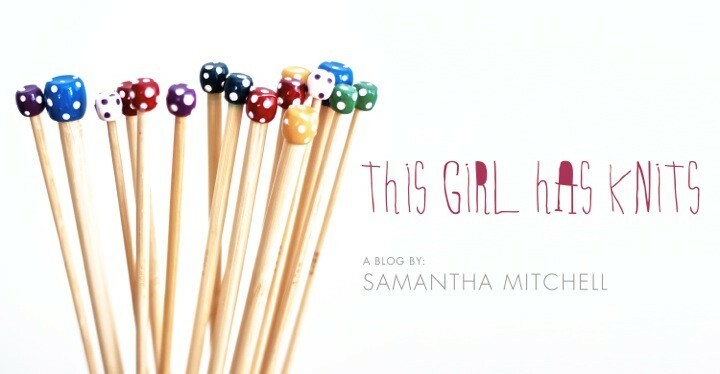 Follow "this girl has knits"
Enter your email address to follow me, and receive notifications of new posts by email.